2007 October : ..the cat came back..
For the longest time I’ve been using a selection of Rio Receivers, affectionately known as the DDAR (Dell Digital Audio Receivers, because Dell briefly sold them too) for my mp3 collection. Initially I had to use the supplied Windows server software, it was almost completely useless with a collection the size of mine and couldn’t be run as a service, so I ended up trying another application, MediaNet. It was streets ahead. I even wrote a short review for automatedhome. The problem was, however, that when I moved to solely using Linux I couldn’t run it. I suppose I could have created a VMWare image and run it in that, but that wasn’t really an acceptable solution for me. In the end I reverted to the very basic solution provided by Jeff Mock. It worked, but was just very very basic. Over the last couple of days I’ve been trying out a series of applications, the two are just a bit of fun really although I suppose they could be a little useful. Earlier this week I had been messing about with SuperKaramba which I eventually removed after it decided it was going to delete some files after I’d modified them, fixing a couple of bugs. The concept of SuperKaramba is fairly sound, I just worry about why I suddenly lost an entire plugin folder for it. Maybe it didn’t like my modifications, I’ll never know. I also noticed that my cpu usage never went below 30% – It had to go, but it was at least interesting to have a look at and it did introduce me to a bit of Python, something I’ve been avoiding looking at for some time now. I haven’t got anything against Python, it’s just yet another language I’m going to have to learn, along with Ruby – but I have no idea what the ‘on Rails’ bit is about, I’m assuming it’s similar to LAMP, although I prefer it in its xampp form. Gltail is a little Ruby application that allows you to look at your logs in 3d. I know it’s not very ‘linux shell’ but it is fun to see. 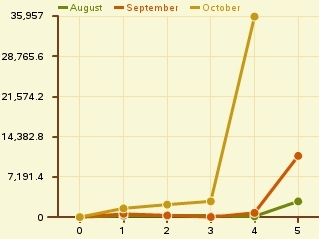 You also get a good idea of which files, images etc are attracting the most attention. 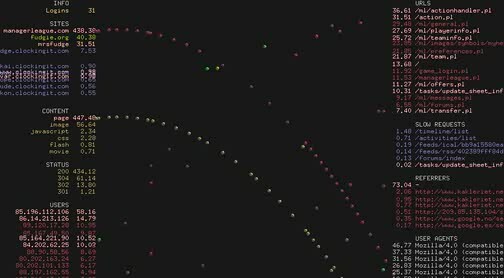 A stream of spheres spits out from each client or server. The sphere’s get bigger and smaller depending on a number of factors, but generally the amount of traffic . There are a number of plugins available for it to allow the monitoring of things like apache logs, or mysql queries. The thing I liked most was that it connects to remote servers over ssh and can use keys. There are a couple of flash movies on the gltail page, one showing when the author was ‘slashdotted’. Gltail is a Ruby application, so it’s another opportunity for learning what I’m going to start calling YAFL – Yet Another F&%$ing Language. I enjoyed throwing a few logs at it to see how well it managed, but could never really compare to the author’s ‘slashdotting’. showing the download bandwidth used, in MB for my buildhost. It’s worth noting that the figures for October are to the end of yesterday, whereas August and September are for the entire months. The last time something like this happened was when I released the very first asterisk live cd although my guide did dramatically increase my hit rate 😀 – incidentally you can get PXE boot and CF card booting editions from the same page as the live cd. My Fon hardware arrived today. It consists of a “La Fonera +” wifi router and a “La Fontenna” antenna. I have to say I haven’t bothered to open the boxes yet at all. My biggest concerns are with the company behind the whole idea and the lack of any real security on the devices. A number of times various representatives of fon have claimed that fon is an opensource company and that anyone can reflash the hardware with additions etc if they want. Well neither of those is true. Fon is not an opensource company, they don’t know the meaning of the words. They might use opensource, but they don’t seem to understand that there is a difference. In terms of the software side, Fon are as opensource as Tivo. They have met their obligation to allow access to the source code, which they used from openwrt , but the hardware only allows images signed by them to be flashed. Incidentally, they didn’t really make any effort to publicize that you could download the source and were indeed in breach of the GPL prior to doing so. So, I’m sitting here with my Fon hardware wondering if I should bother. I started out doing this because I wanted to be able to roam about and have internet access wherever I could find a Fon router – thinking about the GTA02 from FIC and being able to build nice client which would connect whenever it could and tunnel over ssh just to be sure of a little bit of security and privacy. 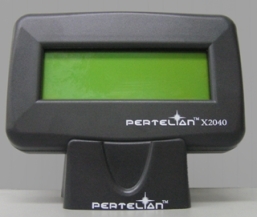 I work at LinITX.com and we sell the X2040 LCD display from Pertelian. LCDproc supports the LCD with no problems but there was no driver for lcd4linux so wrote I one. It has been submitted and accepted for inclusion in the lcd4linux project svn repo. I’ve documented it on the lcd4linux wiki. As an addendum using multiple displays is possible with no real issues.